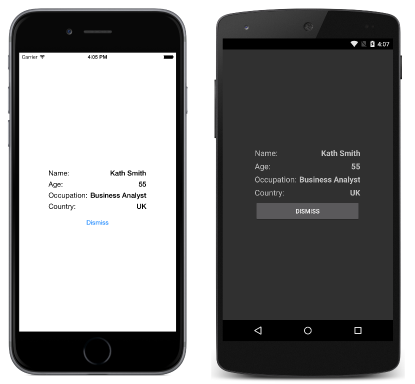 Xamarin.Forms provides support for modal pages. A modal page encourages users to complete a self-contained task that cannot be navigated away from until the task is completed or cancelled. This article demonstrates how to navigate to modal pages. Performing navigation – pushing pages to the modal stack, popping pages from the modal stack, disabling the back button, and animating page transitions. Passing data when navigating – passing data through a page constructor, and through a BindingContext. Modal navigation methods are exposed by the Navigation property on any Page derived types. These methods provide the ability to push modal pages onto the modal stack, and pop modal pages from the modal stack. The Navigation property also exposes a ModalStack property from which the modal pages in the modal stack can be obtained. However, there is no concept of performing modal stack manipulation, or popping to the root page in modal navigation. This is because these operations are not universally supported on the underlying platforms. A NavigationPage instance is not required for performing modal page navigation. The page calling PushModalAsync has its OnDisappearing override invoked, provided that the underlying platform isn't Android. However, the precise order that these events occur is platform dependent. For more information, see Chapter 24 of Charles Petzold's Xamarin.Forms book. The active page can be popped from the modal stack by pressing the Back button on the device, regardless of whether this is a physical button on the device or an on-screen button. The page calling PopModalAsync has its OnDisappearing override invoked. The page being returned to has its OnAppearing override invoked, provided that the underlying platform isn't Android. On Android, the user can always return to the previous page by pressing the standard Back button on the device. If the modal page requires the user to complete a self-contained task before leaving the page, the application must disable the Back button. This can be accomplished by overriding the Page.OnBackButtonPressed method on the modal page. For more information see Chapter 24 of Charles Petzold's Xamarin.Forms book. Sometimes it's necessary for a page to pass data to another page during navigation. Two techniques for accomplishing this are by passing data through a page constructor, and by setting the new page's BindingContext to the data. Each will now be discussed in turn. This code creates a MainPage instance, passing in the current date and time in ISO8601 format. The data is then displayed on the page by setting the Label.Text property. This code sets the BindingContext of the DetailPage instance to the Contact instance, and then navigates to the DetailPage. The data is then displayed on the page by a series of Label controls. This article demonstrated how to navigate to modal pages. A modal page encourages users to complete a self-contained task that cannot be navigated away from until the task is completed or cancelled.